If you’re not compliant at the end of a project, you won’t get an occupation certificate and you can’t trade without one. Like other healthcare practices, dental surgeries are subject to a wide array of national, state and local building codes covering everything from electrical compliance, shielding X-ray equipment to the number of car parks. Yet often these details are the last thing on a dentist’s mind when they hunt for premises. Ellis says that building codes typically move on to the agenda once a specific location has been settled on and the dentist has moved on to the due diligence part of the purchase. And that can be where problems start because, by the time they have reached this stage, dentists tend to emotionally commit to completing the deal. If they then discover there are onerous requirements that need to be met before establishing a practice, it can be hard to unpick things. This is one reason why it would make sense to discuss plans with a professional advisor before looking at premises. They’ll probably recommend any offers you make are hedged with suitable ‘subject-to’ clauses. Finding problems in the build isn’t too bad if the deal hasn’t been signed and defects have been noted. At this stage, the buyer has an opportunity to renegotiate the price or ask for matters to be fixed before completing the purchase. Once a settlement is complete, there is the possibility of a legal claim for misrepresentation but that’s likely to be a long and stressful process. 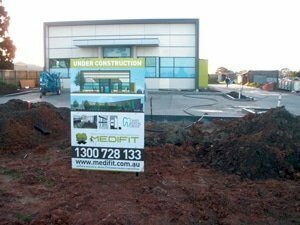 Sam Koranis, managing director of Perth-based Medifit, a design and construction firm for dental and medical practices, explains that building codes aren’t an issue when buying an existing dental surgery—at least not at first. “You don’t have to do anything about the building codes until you start changing things,” Koranis says. “The surgery will have been compliant with codes at the time it was built or last refitted or it wouldn’t be able to operate. “Fresh legislation can’t apply retrospectively, so you’re off the hook until you decide to change anything, then you’ll be subject to the latest codes,” he says. The good news is that if you only change things in a single room, you probably only need to worry about making that room fully compliant. In this case the codes that are most likely to concern you are those to do with electrical and radiation shielding compliance. He says electrical compliance is covered by electro-medical standard AS3003, while the radiation shielding rules vary from state to state. Koranis warns the rules are most onerous in Western Australia and Queensland. Queensland also needs a hydraulics engineer to sign off plans for the plumbing in a surgery. If you’re building a new surgery from scratch, it will need to be designed from the ground up to comply with all the national construction codes along with other state and local codes. When purchasing an existing house for conversion, you’ll need to make any alterations required for compliance. So converting an existing building isn’t just about arranging rooms and installing dental equipment—it could mean adding a wheelchair ramp and widening doors. In older houses, this will also mean knocking down walls and widening corridors and passageways as well as installing disabled toilet facilities. Dentists setting up tenancies in malls and modern high-rise buildings may find some or all of this work has already been done by the building owner. Commercial landlords wanting to attract dentists and similar health professionals often market their properties as being compliant and ready to go. business is design and construction so “we build it as we draw it”. He says there can be complications when a builder or contractor takes plans drawn up elsewhere, doesn’t fully understand the process and fails to comply with the standards. Both Koranis and Ellis warn that structural work to dated buildings, especially suburban houses, can be costly and not just in terms of money—dealing with these matters can be time consuming. In addition to providing access for disabled patients and radiation screening, there are often rules about matters such as energy efficiency. For example, building codes call for low-wattage lights to be used in non-task areas. Building codes are something of a moving target. They are continually updated. According to Koranis, the past decade has seen hundreds of new rules and a fresh emphasis on disability rights, and that’s led to a raft of building code changes to do with access and ensuring disabled people are properly catered for. The national construction codes have been formulated to ensure compliance has continuity throughout Australia. Although codes change to ensure the problems never happen again, building owners are not expected to immediately retrofit premises to meet new codes once they are written into law. On the other hand, any future work will need to comply. Not having the right permits and certificates can be costly. If you’re not compliant at the end of a project, you won’t get an occupation certificate and you can’t trade without one. And, as Ellis points out, ignorance of the law is no excuse. Responsibility is down to you and you have an obligation to either be fully informed about the regulatory framework or seek professional advice from a specialist who can handle this for you. While this costs money, it can be money well spent. Ellis warns of the distraction coming at the moment a dentist should be doing the most to build a new practice. And Koranis points out than when amortised over the life of a surgery fit-out, the cost of professional help amounts to very little.